In the morning didn't go to lectures as we had to set up the surprise for Masha and Sindhu (even though their Birthdays were ageeees ago, I think Masha's was in January! awks). We had exams in Jan and nearly all of us deactivated FB so none of us wished them properly ! how bad! Soooooo we decided to do a little surprise cake cutting thing for them ! lool It was kinda stressful but we got through it! PEOPLE actually turned up! It was more hectic because we had to go Laser quest straight after. 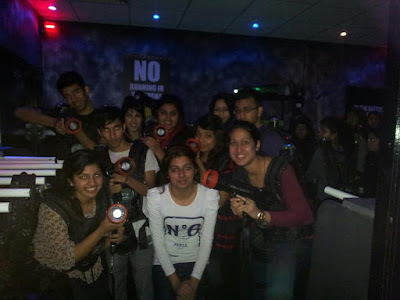 Yeah me and Numan Bhai organised the Laser Quest (where he hardly did anything lool jokes) yeah basically he took care of all the money related stuff and I helped with planning out the day! I remember when we both spent three hours to come up with the teams ! Oh did I forget to mention??!!! 50 people came! good turn out I must say! So After the surprise party we were suppose to meet Numan in front of M&S, but of course he is a boy and boys get hungry and so they go to CHICKS HUT! -_- idiot!! lool he called me to say he is waiting at the train station and told me to bring everyone there! :O like that's an easy task! As soon as it was time to leave uni, all the girls needed to go the toilet and literally EVERY guy went to eat! typical! and on top of that it started RAINING!! woo lol and we got there so late ahaha (Asian's rolling). oh and we got split up and got lost on the way too! -_- a lot happened but it was fun! 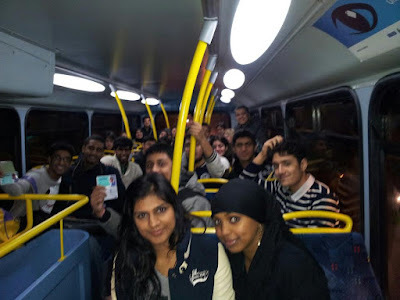 So, 75% of the group took the train to Morden and then they took a bus to the place! This group got split up because we all couldn't fit into the same bus! LOL So stressful because only me and Numan knew where we were going and so people from the other group kept calling to ask for directions! and my phone was just not suitable for that! Jeeves helped out big time! Also around 10 people (including aloo and Sindhu) decided to take the bus straight from tooting to Sutton and they were so late! so we had to delay the game by an hour! Numan was so stressed lol he was proper shouting and everything! awks! In the end, we sorted out the final teams (because there are always few people who are never happy). We finally got to play ! woop.